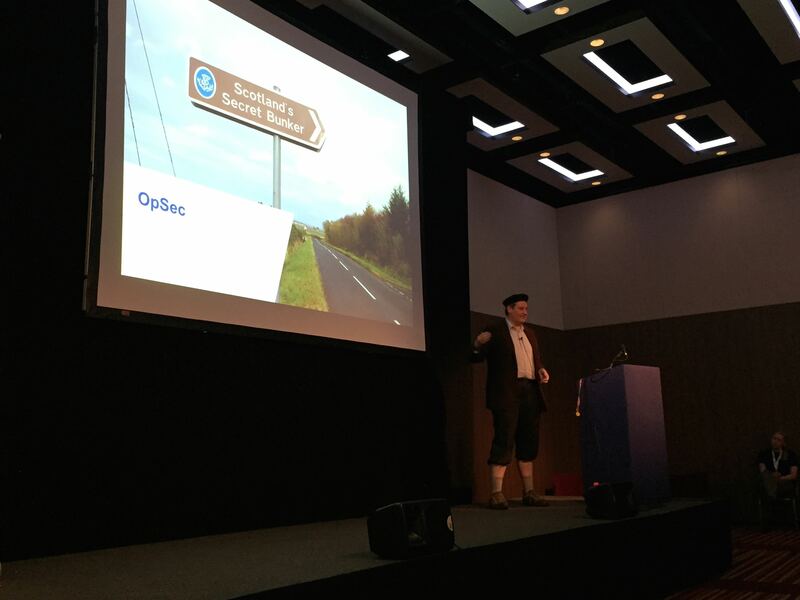 Here is a quick wrap-up of the just finished BSidesLondon. It was already the 5th edition (and my 5th participation!). This year, they moved to a new location close to Earls Court where is organized InfoSec Europe at the same time, good idea for those who want to attend both worlds: Hackers wearing t-shirts VS. Vendors wearing ties! This year, it was just a one-day journey for me, I’m writing this blog post while waiting for my train back to Belgium. The last talk before the lunch break was proposed by Stephen Bonner, a regular speaker at BSidesLondon. He based his talk on samples of Hollywood movies and series. The conclusion: People make decisions based on what they see! Talk about security in a clear way and not in the “Hollywood way“. The next talk was presented by Joe Greenwood: “Crash all the things”. Joe was an pilot before he switched to the infosec field and knows his topic. That’s why he decided to focus his research on the communication protocols used between airplanes, specifically the ones used in collision avoidance systems. All airplanes have radio systems which allow them to exchange critical information between them and pilots get visual alerts when a risk of collision occurs. This system is based on the ADS-B and T-CAS protocols. Guess what? Those protocols are completely insecure (no encryption, no authentication, …). For an airplane, any received ADS-B message is generated by another airplane! Why should it be something else? :-). The fact that those protocols are “open” means that anybody can listen to them, that’s why we have nice websites or apps like FlightRadar24. The goal of Joe’s research was to test if it is possible to send bad messages to an airplane and generate false alerts in the cockpit? It’s of course not easy to test that in real life. Joe built his lab with a HackRF (a classic device when you need to send some packets over the air) and GNURadio. The victim was a flight simulator. Modern simulator, being multiplayer have features to receive ADS-B message from 3rd parties. Joe explained how are constructed ADS-B packets and he wrote some tools to generate them on the fly. 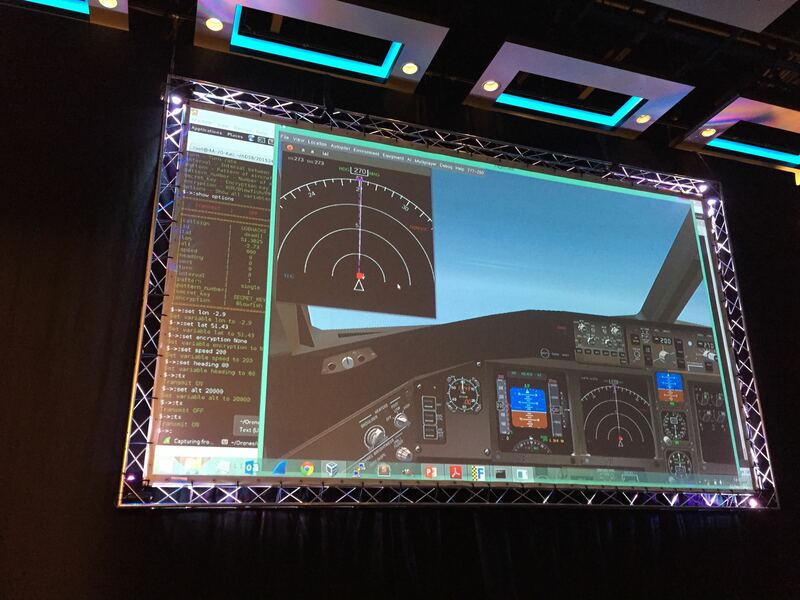 The presentation ended with a live demo of a Kali VM sending ADS-B message to the flight simulator running on the same laptop. Crazy to suddenly see 10 ghost airplanes displayed on the radar! What about the countermeasures? If they are plenty of ground stations which can detect rogue flights, an airplane has only one antenna which make the always vulnerable. Can you imagine a Raspberry or a Beaglebone with a HackRF dropped close to an big airport and remotely controlled? Very nice talk! 75% of the Americans would feel grumpier after one week without WiFi than without coffee! Before speaking about his tool, George explained how his tool works (and any other apps of the same kind). 802.11 has many weaknesses that keeps it vulnerable to classic attacks even if encryption is used (WEP/WPA/WPA2). The management frames (beacon frames & probe requests) are always send in clear. What happened when a device see two access-points with the same ESSID? Usually, the network manager choose the one which has the stronger signal. Based on all these information, we are facing classic attacks like Karma, Evil Twin. Those were also explained by George. Nothing brand new but always a good reminder. The second part of the talk focused on the tool WifiPhisher. It looks to be interesting because it integrates all the steps to collect passphares and/or credentials from targeted users (a typical target for WifiPhisher are users being a capture portal). A nice feature is the detection mechanism of the access-point using the MAC address to propose to the victim a specific fake webpage. Note that if you’ve a PineApple (link), you can basically achieve the same results with extra infusions. Then, Jessica Barker proposed a non-technical but interesting talk: “Bringing Infosec to the masses”. She discussed the fact that we are talking different languages. She started by speaking in Klingon. Nobody understood! It’s the same in the information security field: we are talking to people with the wrong language. The goal is to reduce the gap between people and technologies but using the right words to attract their attention. We, as infosec, are trying to protect computers used by people that do not think as ourselves! That’s the wrap-up of the talks that I attended. There was 3 slots in parallel (two main rooms and the rookie track) with some workshops. From what I eared, the rookie track was very successful. I hope to see all the presentations online soon! Next event for me, BSidesLisbon in one month.